February 2011 | These days most travellers carry multiple electronic devices (e.g, laptop, smartphone, iPad). Once they arrive at the airport and are waiting for their flight, for many their main need is a comfortable place to sit, Internet access and a source of power for their electronics to stay charged. As power outlets at airports are often hidden in uncomfortable places, Samsung Mobile spotted an opportunity and in recent years in cooperation with JC Decaux has installed free branded charging stations at airports in the USA, Europe, and most recently at Tokyo Haneda Airport. On a similar note, airline alliance Oneworld introduced ‘Oneworld Charging Stations‘ at airports in Europe and the U.S.
Today, at many airports a ‘recharging infrastructure’ seems to be more or less in place as several examples from North America show. 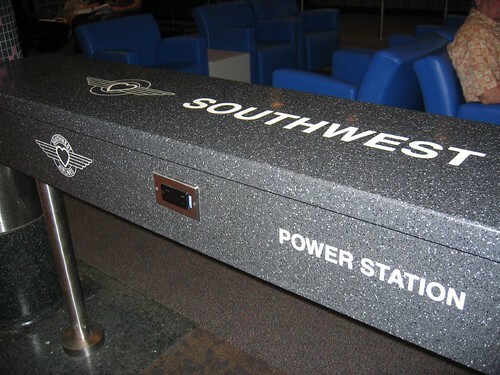 For example, Minneapolis St Paul Airport has a Raddisson Hotels ‘Recharge Area’, Las Vegas Airport sports a Verizon-sponsored ‘Recharge Zone’, while in Canada, Toronto Airport’s ‘FlyAway Power Stations’ integrate seating with a desk, WiFi and power outlets. At Boston Logan Airport, seats that incorporate a power outlet are marked with a clear charging icon. Adding to this, airlines such as Southwest and Delta offer respectively ‘Powerstation’ and ‘Relax and Recharge’ counters at several arports in the U.S., and Delta is currently installing ‘Delta re-charging stations’ in gate areas at 19 airports across the U.S. Meanwhile, developments in wireless re-charging have advanced rapidly in recent years. For example, battery brand Duracel now offers a ‘MyGrid’ charging pad (In Duracell’s words: ‘drop & go charging’) for around USD 60. Several airlines and airports have also jumped on this novel technology and are currently rolling out wireless charging pads at airports and in lounges. As part of Delta’s USD2 billion overall investment to improve its airport facilities and onboard services through 2013 (which has put the airline in 4th place on airlinetrends.com’s innovative airlines ranking) the airline is placing WildCharge ‘wireless powerpads’ in the seating areas of its domestic Delta SkyClub lounges. The WildCharge pads are designed for lower power charging devices such as cell phones, smart phones and e-readers, and up to 8 devices can charge simultaneously. Adapters for a variety of different devices are available from Delta staff in the lounge. Finland-based Powerkiss just announced it has teamed up with airport F&B operator SSP to provide its wireless charging service at SSP outlets across Europe. Powerkiss’ charging technology is integrated into the furniture surface, which enables passengers to recharge their device in the same place as where they are sitting. 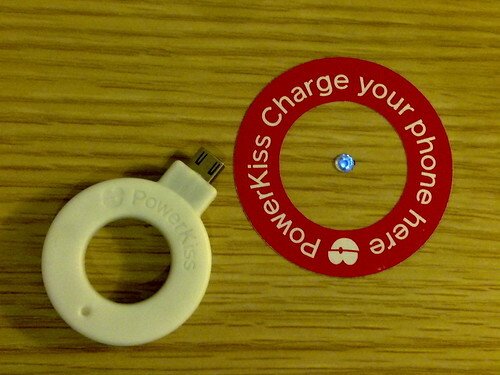 To use the service, customers collect a receiver ‘ring’ at the outlet, plug it into their mobile device and then lay it onto PowerKiss-enabled tables installed throughout the restaurant or café. The free Powerkiss service was originally trialled at Helsinki-Vantaa Airport (for example in Finnair’s lounge) and is about to be rolled out at around 30 airports across Europe, including Frankfurt, Copenhagen, Stockholm, Paris CDG, Zurich and Manchester airports. At this year’s Consumer Electronics Show, Powermat, a manufacturer of wireless charging mats, and Canadian public seating specialist Arconas announced a new seating concept that integrates wireless charging technology. Powermat has placed built-in charging stations into the surfaces between the airport seats, allowing users to place up to three devices on the charging mat for wireless charging. Arconas supplies seats to 130 airports around the world, but has yet to announce the first airport where the wireless charging seat will become available.